Using a sun protected kid swimsuit could at least cut down your child's exposure to the sun since it is not possible to avoid the sun when one goes swimming. Sun care and protection is very important as previous studies have confirmed that sun exposure is responsible for the development of at least two-thirds of all melanomas, the most deadly form of skin cancer. 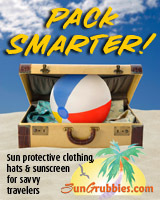 Besides using a sun protected kid swimsuit, parents are reminded to also use sunscreens rated SPF 15 or higher. Remember to reapply them should they continue to stay in the sun. The medical community recommends full head-to-toe sun protection, hence, wherever the kid swimwear didn't cover, use sunscreen and headgear such as a wide brim hat . With the current awareness on the danger of sun exposure, you can now find kid swim suit that has up to 98% UV protection as well as many other type of protective clothing to minimise the exposure. One severe sunburn as a child, more than doubles the risk of skin cancer later in life!